The Lion Horoscope, at the West-Terrace of the Nemrud, is the oldest known horoscope in the world. It depicts a constellation which will not be seen for the forthcoming 25,000 years. The animation shows the heavens as if you yourself were present at the West-Terrace on top of the Nemrud on the 14th of July 109 B.C. Please, enjoy it! The Lion Horoscope is a stone slab measuring 1.75 x 2.40 metres and a thickness of 0.47 metres. It shows a lion marching to the right. It is the Lion Horoscope. The body of the lion is covered with nineteen stars. Each star has eight pointed rays. Apart from small differences the positions of the nineteen stars represent the constellation of Lion as described in the ancient star table of Eratosthenes. The lion wears a sickle under his neck, symbolising the New Moon. Above this disk the star Regulus radiates. Regulus has been associated with the king throughout the history of mankind. It was named Regulus by Copernicus after the earlier “Rex”, equivalent to the “Basileos” of Ptolemeus. In ancient Akkad the star was known as “Amil-gal-ur” King-of-the-celestial-sphere. In Babylonia as “Sharu” the King. In ancient Persia as “Miyan” the Centre, leader of the four royal stars. The Lion Horoscope is a frozen picture of the positions of the heavenly bodies at a certain time on a certain date. But what date? From the beginning it was assumed that king Antiochus must have commissioned the Lion Horoscope. As a result astronomers were asked to investigate corresponding planetary configurations between 100 and 50 BC. The above-mentioned assumption was the cause of much subsequent confusion. What if the constellation as depicted on the Lion Horoscope would be before or after that period? In that case one will find at the best look-alike constellations and endless discussions will start. And so it happened; many dates were proposed and rejected. Otto Neugebauer proposed the 7th July 62 BC, but most archaeologists are not aware that according to Neugebauer it can be also the 6th July. As Friedrich Karl Dörner wrote in his letter dated 12th March 1987 to Otto Neugebauer (archive Crijns): “Meanwhile, the calculated dates have all but a small flaw.” You find only one date by dropping the assumption that the search period has to be from 100 to 50 BC, i.e., the 14th July 109 BC (article available at http://www.babesch.org/77moormann.html). A final article is published in the book ‘Nemrud Dağı’ by Professor Herman Brijder, see 2001-2003 RESULTS. Jupiter needs about twelve years to pass the ecliptic, Mars two years and Mercury one year. The moon passes the ecliptic in about one month. So the slow planets Jupiter and Mars show the year, Mercury the month and the moon shows the day. 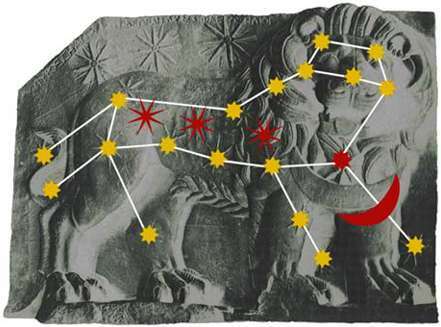 First the years were selected in which Jupiter was in the constellation of Lion as depicted at the stone slab. From these years those were selected in which Mars was also moving through this part of the ecliptic. And the same for Mercury. The second selection criterion was the sequence of these planets, being Mars-Mercury-Jupiter according to the Lion Horoscope. As a result the constellation of the 14th of July 109 B.C. was selected. Normally Mercury cannot be seen with the naked eye most of the time. However, on this particular day Mercury had almost reached its maximum distance from the Sun and was therefore visible. The time lapse between sunset and descending of the moon was about 17 minutes. If the moon-Regulus conjunction was visible from top of the mountain, it was only very short; just before the descending of the moon at about 19h37 Local Real Time. In the minutes before, the complete constellation as depicted on the Lion Horoscope was in place. This particular phenomenon makes it possible to determine not only the date but also the time of the constellation, being 19h35 Local Real Time. So, the Lion Horoscope indicates not only the date of that particular constellation but even the exact hour ! The 14th of July probably equals the 10th of Loos mentioned in the inscriptions as the day of the coronation. So, this particular date of 14th of July 109 B.C. may refer to the coronation of the king. Though archaeologists believe that the reliefs are of Antiochos, it is more logical to assume that these reliefs commemorate the coronation day of his father Mithridates. On that particular day the king and his court may have assembled on top of Mount Nemrud to watch this phenomenon in the heavens. If you would have been present, perhaps you could have seen how Mithridates and his father King Samos II were standing at the West-Terrace and watched the sunset as many tourists do until today. In the rapidly fading sunlight, you would have seen the fine silver crescent of the moon and immediately above it, the bright shining of the star Regulus. Regulus, the star of the king, shining above the moon, the people of Kommagene. Is there a more beautiful symbol ? You could also see Jupiter, Mercury and finally Mars, the red planet. On the nights before, everyone in Kommagene had followed their path through the heavens. The people had watched how the planets passed the royal star Regulus. One after the other, Jupiter on June 18, Mars on June 21 and Mercury on July 6, they passed Regulus from above. It seemed to the Kommagenians as if the gods came to welcome their new king. Before the last gleam of sunlight had died away, it was time for the moon to set. Followed by Regulus, the moon sank behind the Taurus range. Only the gods stayed in the sky and watched when the new king received the diadem. Antiochos, the son of King Mithridates, constructed the five colossal statues next to the five reliefs. The gods depicted are identical, but the sequence is not. These statues are Apollo, Kommagene, Zeus and Herakles. He flanked the five colossi likewise with an eagle and a lion. Only they are much larger than those of the reliefs. As Antiochos said : “I was determined to leave behind all the sanctuaries of my ancestors bigger and more beautiful”. And so he did. (c) copyright 1995 Maurice Crijns, reviewed September 1999. With gratitude I would like to thank Dr. J.Meeus, P.Eng. J.Rademaker, Professor C. de Jager of the Space Research Organization Netherlands and Dr. G. Schilling of the Artis Planetarium for their contribution and support. My special thanks are expressed to Professor S. Şahin for his generous cooperation.